Hello everybody. 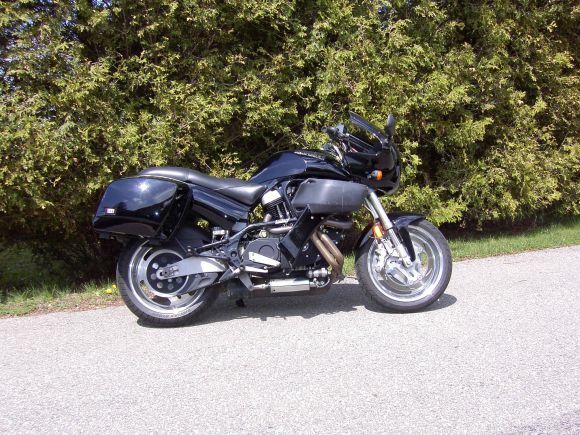 I finally decided to look for a Buell site. Glad I found this one. I look forward to checking out what you guys have going on here. 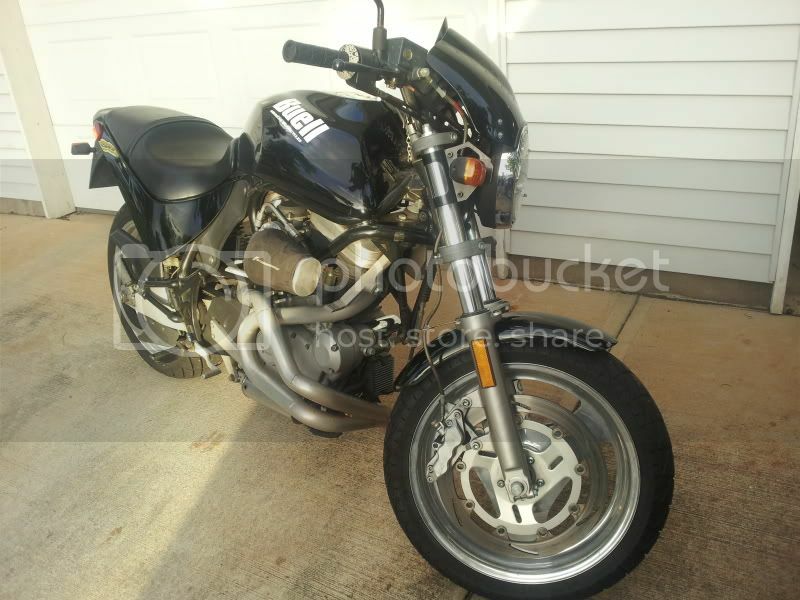 hi ladies and gentlemen, i don't have a bike but i'm looking at a 04 xb9s and joined to do some research on buells. Garrett Owens told me about this place. he has a couple of buells one of them he drag races. Hello, I am the new owner of a Buell Ulysses XB12X. This is a great community and information source, very helpful when researching issues before buying the bike! Not a great picture, but it’s a great bike!!! I recently bought an 1125R from a guy who rebuilt it from salvage. He showed me the bent front fork he replaced. He didn't think the rider could have survived. I'll have to be careful. I rode dirt bikes as a kid (currently have a Yamaha enduro 250, and have decided to learn street riding. This 1125R is a bit scuffed, and I have to get the bike working solid. I've been lurking for months while considering the purchase of a Ulysses. I recently found a 2009 XP (police) with very low miles and could not resist. Unfortunately, all the cool stuff has been removed... This site has been a great resource - thank you! I have some questions so thanks in advance for any support you can offer! Welcome aboard ! ! ... You'll love the XP. Don't sweat loosing the cop stuff ...... You won't fall victim to using it and getting in trouble. In addition, it's all in the parts catalog. I bought most of it through dealers just to see if I could. Check out the Big, Bad and Dirty section for Uly questions. I have to speak up. I have had my Uly for 2 years now and it is one of the best twins I have ever owned. I feel it has great power to weight in stock form runs great at 70+ with still more to fast pass. Made a 2500 mile ride to florida with 1000 in the rain and was really a secure ride, I will enjoy my retirement with the Uly in my fleet. I'm in the Cuba Mo. area just off rt66,in the area stop by and the beers in the ice box! Howday folks. I'm the proud owner of a Buell S3T, Black with PM rims and wide side bags. Bought it from my friend who's owned it since new. He's retired and rides a HD Touring and the S3T hasn't seen much of the road for the last 3 years. I've been eyeing it for the last two years and couldn't stand looking at it parked. Took it for a few rides this past summer and had to have it. Florida this February and meet up with my buddy I bought the bike from. Guess I should mention, I live in London, Ontario, Canada. I also ride a 1200 C Sportster. Returned to riding after the obligated waiting period. Previously rode sport bikes in my youthful wisdom. The HD is fun but, lacks comfort for the longer rides I plan on. And it's limited fuel range could get me into trouble in more remote areas. Although it's nice to get off and stretch to fuel up. I love the sound and character of HDs little twin. I couldn't see myself going to a Road King or Road Glide. I'm not a HD snob. Love all brands but, get drawn to bikes with character. I think I could find a model from every brand, given unlimited resources and space for them all. I love Truimph and Ducati as well. I like "classic" looks but, also appreciate modern bikes just as much. Yup, just about sums it up. Looking forward to finding some adventure and the roads less travelled this year. Take a look at this Blast. Obviously modified with a seat similar to a dirt bike. Seat is much higher than stock. The swingarm looks like it is from one of the other tube frame Buells. The front end bits are obviously redone too. I think it improves the look of the Blast. Sorry, I have no details about this but if I had a Blast I think I would work toward modifications similar to this. You should really be posting for help in the Thumper (Blast) section. You will probably get help that way. Good luck. This is me checking in: new owner of a 2009 1125R. Looking forward to riding it when the weather improves! My name is Kyle Jaquess and I am a graduate student at California State University, San Bernardino, as well as an avid motorcyclist. I've been riding for about 4 years with still so much to learn. I am currently working on a research project examining the behaviors of motorcyclists. The survey details are still getting finalized, but I hope to get some support from the riding community on various forums for participation in this project. Just jumped in today. I now have a 98 S3 and needed a place to go for all this and that Buell. 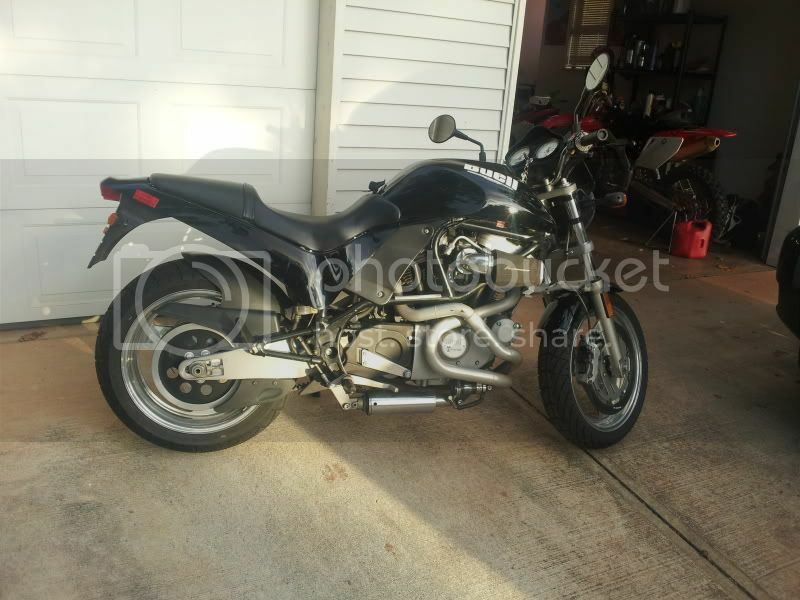 I also have a 01' Sporty 1200 but it will have to sell to fund and embark on this new adventure on the S3. Looks like a great forum . Thanks for havin' me in. I'm Jeff and just got a 01 M2. The weather has been sketchy and I've been busy so I haven't had a chance to get to know the beast. The test ride was very promising and I really liked the power and seating position. After having cafe racers and big enduro machines, it's nice to have a standard type of motorcycle once again. Wonderful bike. I think in 01 you already have the updated primary tensioner from the factory (can somebody confirm?). I think you also have the updated shifter (straight, instead of up and over). I don't know if you would have the new front exhaust mount though... probably not. Its like an upside down Y, nice beefy thing. Not a stamped steel hanger. Run your belt scary loose... After a lot of self induced misery from running too tight (read: what the service manual said to do), I would just adjust it so that as I sit my fat but on the bike, I can reach down and push the belt so it will just touch the swing arm as it comes under tension. In general, too loose is safer for the bike than too tight. At 20k miles or so, you probably want to drop the oil pump, and peek up in the cam cavity at the oil pump pinion gear. Some run forever, others have case machining issues that cause a tolerance error stackup, and the gear wears. Click my name to the left and look at my profile picture, that is what you will see. bump the starter a few times to see both sides of the gear, if it is wearing it will wear more on one side. Great bike, you will love it. I loved the 9sx I replaced my M2 with, and love the Uly that replaced the 9sx, but still often miss every Buell I ever sold. The M2 is likely one of the best Buells ever built. It sounds like you got a great one. Keep a finger dipped in the well of wisdom . . . ride . . enjoy. The M2 is likely one of the best Buells ever built. 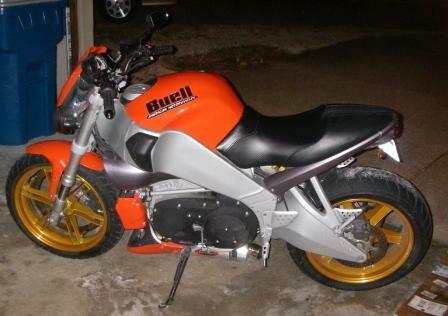 I stand corrected . . the Buell M2 Cyclone is one of the best MOTORCYCLES ever built. hello all, i just joined the buell family! just purchased a 2002 cyclone m2L with 12,000 miles with some aftermarket goodies! Hi Everyone. This is my 2nd time around here. I had a '99 M2 in '04 but only kept it for about a year. I've had the Buell itch for a few months. After waiting for an SS in my budget to pop up locally I tried an '03 xb9s and found out I fit just fine. The bike is set up great and is ready to go. The only major mod I'm looking at is replacing the orange plastics with black. This is replacing a '98 Speed Triple that was perfectly competent but too civilized. The grin factor with the Buell is constant. After years of swapping around through different sport twins I'm looking to settle down into a long-term relationship. This has been a great site for info and help and as a complete non-mechanical type I thank everyone for their help ahead of time. I own and operate a small powder and ceramic coating shop in Rushford, MN and just coated a Buell exhaust system. Got this web site from a customer. Hello all from Chicago Illinois and new to the Buell world but not bikes, my background consist of GSXR's, Yamaha R1, R6, Harley Davidson Street Glide (my baby and now an all White Buell 1125R. Looking forward to some mods and lots of questions. Awesome board! Hello, my name is Gary and I am a friend of Buell W. I began motorized riding on a minibike when I was 8 and progressed thru the ranks till I maxed out on a 82 GPz1100. Good looks, fuel injected, lotta power and a lotta weight. Traded that for a lighter 75 Ducati 860GT. Rode that for a few good years till I got knocked off. Rebuilt and sold it. Then bought my first Sportster, a standard. Rubbermounted buckhorn bars, soft forks, soft seat, soft engine. Sold it as soon as I heard about this other sporty v-twin, a 87 Ducati 750 Paso. Owned it 20 years and 50k miles. Some of which were Sacramento to Edmonton and back. 12 days. With girlfriend. Was the most comfortable bike I ever owned. More than the 92 Ducati 907ie I bought and sold in the same year. So I've had this 2001 HD XL1200C for about 4 years and I'm tired of the feet forward thing. Longing for my roots. Its got Buell heads and pistons so I've had a taste and I want more. 21" chrome spoked front rim, 18" slotted aluminum rear wheel. Deep forest green with lotsa chrome. Kuriakyn grips forward controls and intake. Supertrap 2into1 pipe. 8-9/10. Good evening everyone. After years of missing my first Buell I have finally become a proud owner of a new to me 2001 Buell X1. 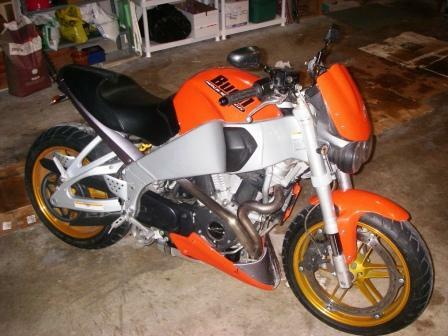 I originally purchase a 2001 Buell X1 back in 2002 but had to sell it in 2004. I have dreamed about owning another X1 eversince. I have stopped by this forum many times to see what everyone was talking about and to see if I ever ran across my old bike. I frequently check craigslist and cycle trader for years hoping to find my bike but never found it. 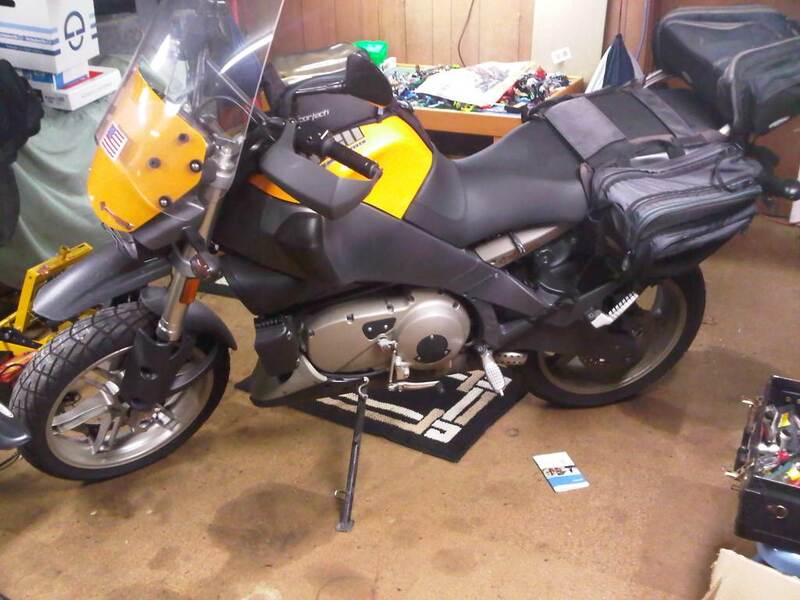 I recently found a Buell X1 that is almost stock with only 6300 miles. I drove down and picked it up yesterday. I was so excited for the past couple of days I felt like a little kid. It's funny what these bikes will do to you. I look forward to learning as much as I can from everyone and sharing any knowledge that I have. Hello to all. 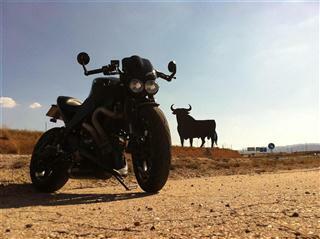 Hello all, this is the first time posting on any buell forum. I have been here repeatedly in the past few weeks looking for answers on other threads and have learned a lot just by doing so, but have more questions to ask. Im a first time buell owner, just bought my 2001 x1 last fall and have loved everything about it! Im currently in the process of painting it black and adding a few mods. hope to get the help I need here.